I probably would have enjoyed reading a collection of essays more if I hadn’t been reading Harold Bloom’s new book at the same time. The two books were vastly different, but the lack of straight-up storytelling left me a little bogged down. Still, Albert Camus remains one of my favorite authors and if I have any criticism for his essays, it wasn’t that they were dry. The lyrical essays were split into three sections. The first section, “The Wrong Side and the Right Side,” were all philosophical musings with titles like “Irony” and “Death in the Soul” and “Love of Life,” and this was my favorite part of the entire book. The next two sections were more about nature and towns Camus had lived in— lots of sunsets and seashores and a general feeling of freedom. This part of the book was a breath of fresh air at first, but being drenched in Camus’ sentimentality and nostalgia got a little wearing after a while. I only skimmed the critical essays, giving about six of the fifteen my full attention. None of the subject matter was uninteresting, but I was burned out and craving some fiction by this time. The last part of the book, “Camus on Himself,” was fun as far as biographies go, but it didn’t enhance anything I’d already learned about Camus’ outlook on life by reading his other books. At any rate, don’t let this ambivalent review curb any interest you have in Camus’ writing. If you’re in the mood for essays, this is a collection that won’t bore you. 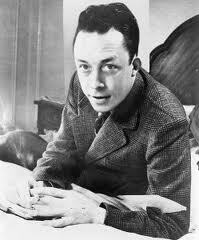 I'm Albert Camus, and I approve this message.